No formal walking tour—instead a gathering. As I advised the Oscar Wilde Bar on their drinks menu, I think it’s only right if I occasionally test the menu. So a few of us will be Oscaring Wildely at the Oscar Wilde Bar on 27th St. just after 1:00 PM on Wednesday 26th. 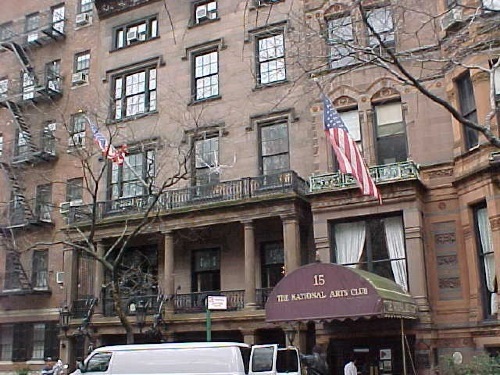 Perhaps afterwards, if anyone is interested, we’ll jaunt around one or two stops on my Oscar Wilde In New York walking tour. Free to join us (maitre’d will know who we are) and in the mean time get in the mood by reading my blog review of the Oscar Wilde Bar. Did you know that long before his dramatic life in London and Paris, Oscar Wilde, the Irish poet, dramatist and wit, spent an entire year in America as he conducted an extended lecture tour across the continent? And nowhere did he spend more time than in New York City. Join us as we take a leafy stroll through Madison Square Park, Gramercy Park, and Greenwich Village to trace Oscar Wilde’s debut in the social and literary world. Set in an era of fascinating personalities, we visit historic places including houses where Oscar Wilde lived and clubs that he visited. The tour also incorporates exhibits of Wilde’s letters, period photographs, and often features a play-reading or a convivial gathering for discussion. Based on original and unique research into Wilde and his circle in the New York of the gilded age, you will learn how Wilde was influenced by the aesthetic movement of the period, and how, in turn, he influenced the society of today. These tours will appeal not only to anyone with a literary and historical interest of the city, but they are detailed enough to inform even scholars of Oscar Wilde—the self-styled genius who is more relevant today than he has ever been.